Officials in Ottawa and Toronto are investigating a string of hate crimes targeting places of worship and schools. 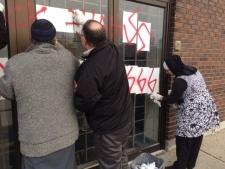 On Friday, Ottawa police confirmed two occurrences of hate graffiti, saying that they received a call about red swastikas and racial slurs spray-painted on a local church. Less than an hour later, police confirmed another incident at an Ottawa mosque, making it the fifth incident in the city since Sunday, Nov. 13. On Friday, local community members gathered at the mosque to help clean up the paint on the doors. Earlier this week, Ottawa’s Jewish community was also targeted in three separate incidents. The most recent one happened Wednesday night at the Machzikei Hadas synagogue in southeast Ottawa, where swastikas were spray-painted on the door and anti-Semitic graffiti splashed over its brick walls. On Tuesday, similar symbols were sprayed on the door of a woman who runs a Jewish prayer centre in the Glebe. An Israeli synagogue, Ottawa’s oldest, was also targeted on Sunday, Nov. 13. Members of the community are outraged and demonstrations of support have come from across the country. “To have this kind of despicable language and symbolism on mosques and churches and synagogues, is not the Ottawa that we all know,” Watson later told CTV Ottawa. Brand new nazi graffiti on the door of Parkdale United Church one block from my house. I'm sorry for putting the slur in your feeds. I feel sick about it. Conservative MPs issued statements on Friday condemning the hateful acts in Ottawa. Meanwhile, in Toronto the public school board is investigating multiple racist incidents. The Toronto District School Board has sent an email to parents about “a number of disturbing incidents of racism and hate”. The email doesn’t go into details about the occurrences, but according to local media there were signs posted near schools denouncing multiculturalism.